Happy Monday and happy Stampede to all those of you who are in Calgary enjoying the festivities! I was on the grounds last night with Sabrina until the last firework had been shot and the last beer had been poured. We’ve both taken 3 days off work so we can do Stampede on the first day, recover the next, and then go back to see all the things we missed on third. Today is the resting day and boy do we need it! We went down on Stampede Family Day so for the first several hours we couldn’t take a step without bumping in to kids and parents alike. As the day went on the grounds got emptier and emptier as the young one’s legs gave out and parents had to take them home for the night. It was eerie how little people there seemed to be on the midway where all the rides are. We didn’t find crowds until we either went to the wash room or tried to buy food. It was an awesome night and while I don’t remember the names of any of the dozens of people I met I won’t forget the memories of partying with them any time soon. 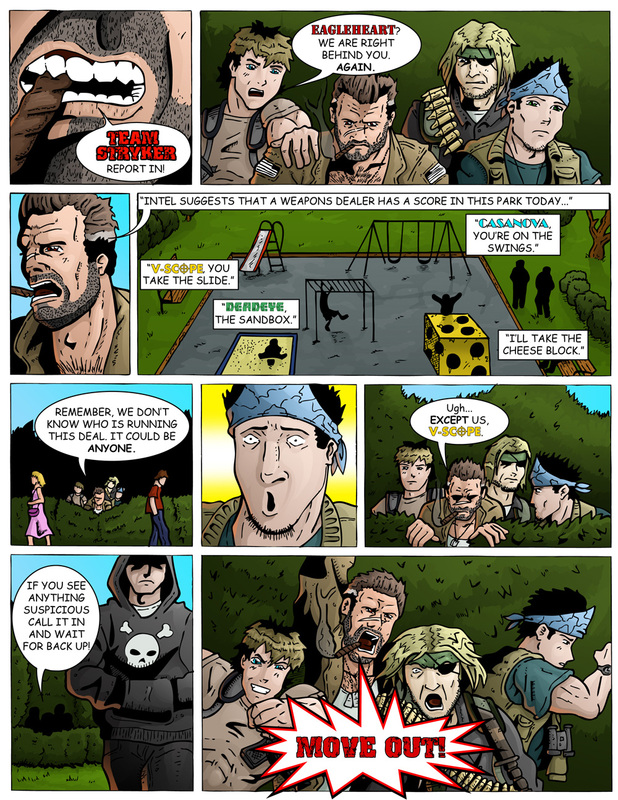 Now for the news at hand: Page 01 of Mission 002 has arrived! With this issue I wanted everything to be ramped up to 11. When I originally I drew the first page it was 20 panels. 20 panels! I was so excited when I started that I just wanted to throw everything and the kitchen sink. Luckily I toned it down before I did the final inks. I was just so excited when I started writing it I wanted to just jump right into the thick of it. Hopefully this page is enticing enough to bring you back on Thursday for page 02!